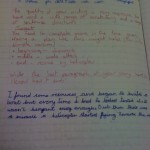 I recently looked at some of my exercise books from last year to look at the progress pupils had made over time. Overall, the class had improved but there were a handful of students who had not made the leaps that others had. 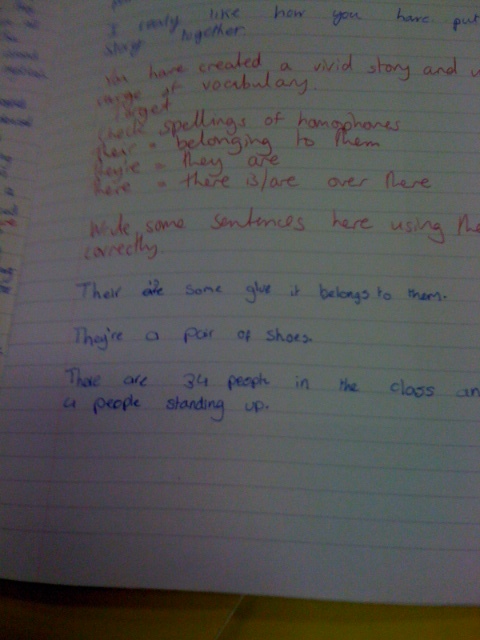 They were marked regularly with good formative comments. Yet there were a few pupils who didn’t really improve the things that I had set for them as individual targets. They got better over time but the impact of my feedback was not particularly evident. I spent a great deal of my time on marking those books and I don’t want any of that time wasted! I don’t mark because I might get in trouble for not doing so- I mark because it will help my students. Therefore, one of my developmental targets this year has been to ensure that there is greater impact from my written feedback. “Teachers are selective in their marking – deciding which pieces of work to give particular attention and which aspects of the work to focus on. Teachers identify successes related to the learning intention, pointing out particular parts of the work or making specific comments about it as a whole. They use comments only, not a grade or a mark, nor anything else that could be interpreted as such, for example a ‘sticker’, a ‘smiley face’ or a merit. Teachers indicate progress by referring to the pupil’s previous work. They specify something that could be improved, or the next steps to take, and give guidance on how to do so. Pupils understand the feedback, are clear about what it means and what they have to do. Time is routinely made available for pupils to work on their improvement points. Teachers work together to improve the quality of the feedback, and value quality above quantity. 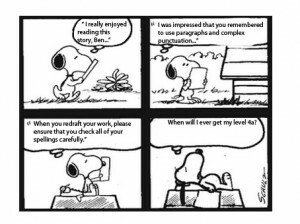 I have tried to develop methods to ensure that my written feedback has the maximum possible impact. That includes many elements of the process: before, during and after. This means getting the quality right to ensure that all that time spent marking is worthwhile. I know that this seems painfully straightforward but it is important to share the success criteria for the piece of work. I have just marked a piece of work where I didn’t do this and had to write the phrase ‘remember to use spoken language terminology’ an awful lot. Using style models and analysing them before embarking on a new piece of work is also a useful way of making it explicit what success will look like. When I send work emails or even when I tweet, I check them several times. (I have reread the final version of this blog 6 times) This is probably too much but I know that I will inevitably make some errors or just have some bits which don’t quite read right. Having a bit of time for pupils to check their work before handing in saves me a great deal of time and helps make my marking much more focussed. Another excellent way of ensuring that pupils make it their best work is having a ‘real’ audience for their work. If they know others are going to read their work, they do not want to make any sloppy mistakes. I’d also say at this point that I don’t formally mark every piece of work that the students produce. 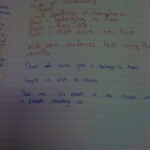 I read everything but I ensure pupils are aware when there is a task I will mark in detail. I find that marking in this way reduces my workload but increases the impact. Lots has been written on what good quality written feedback should look like. I will not go into too much detail here. I like Geoff Petty’s simple medal and mission idea. Comments only, no grades. Below is Dylan Wiliam speaking about feedback. I reflect on the impact of my teaching. If the whole class are receiving the same target, is this because my teaching wasn’t quite up to it? We have a ‘no red pen’ policy and are encouraged to use green. I use pink as a protest. I like this simple idea from Kristian Still– feedback is written sideways in books so they have to turn books to read it. Write a question after the feedback that they must answer. 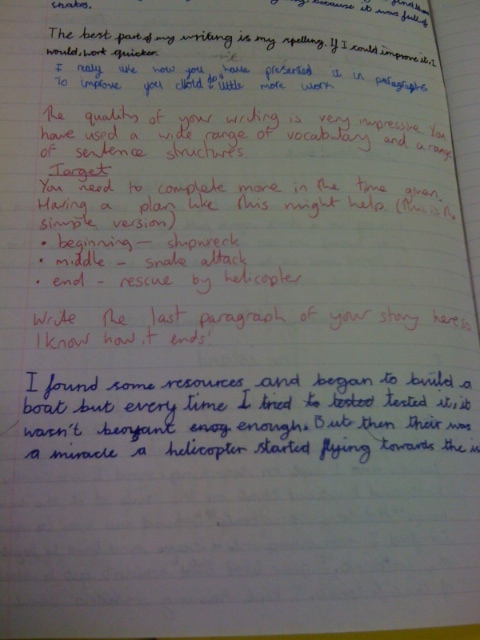 Hide the feedback: Write the pupils’ comments in another page in the book. They have to find them. This might look strange in a book scrutiny however! Correct the first half of a pupils’ work. They correct the second half. 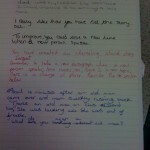 Self assessment 2.0: Pupils hand in a piece of work to be marked. The teacher photocopies it then marks as usual. 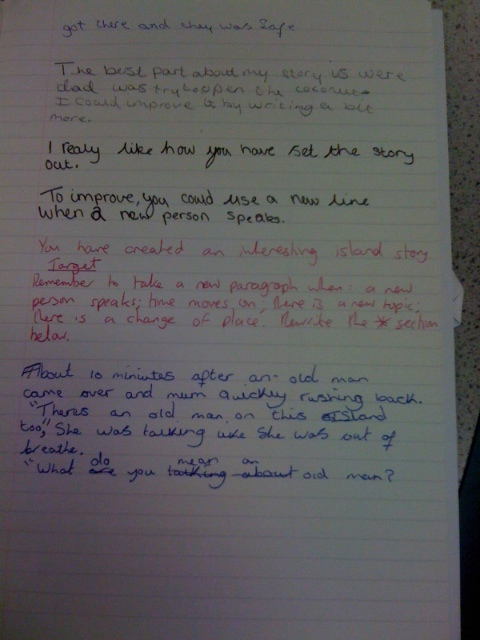 In the feedback lesson, students mark their own then compare their version with the teacher’s. They then reflect on this. Cartoon feedback: My colleague made this. She used photoshop but there are a number of cartoon making sites such as ReadWriteThink and Witty Comics There are any number of ways that this could be used such as making a stock of blank ones. Teachers could leave the last bubble blank for pupils to comment. 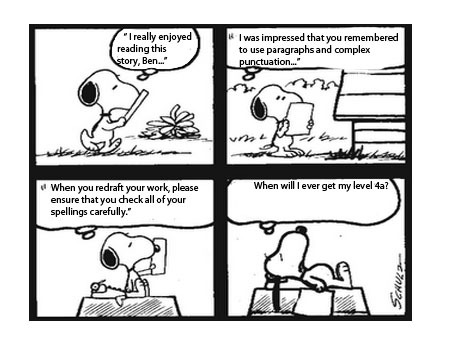 Coded Feedback: Feedback is written in such a way that it has to be ‘translated’ e.g. in another language, an anagram etc. Late night marking (from The Lazy Teacher): Give pupils the wrong feedback and ask them to explain why it is the wrong feedback. I have developed this further by handing pupils their feedback on slips but to the wrong pupils. They have to find their own feedback. Pupils must prepare a starter activity to teach the rest of the class on the subject of their target. Arrange your seating plan to seat pupils with the same targets together. They can support each other and you can help them together. Alternatively, you could pair a pupil with a particular target with someone who is strong in that area. I have tried to maintain a serious tone but I will add here that I have something called ‘Feedback Friday’ with its own theme tune and a call and response: ‘when I say feedback, you say Friday.’ I met a parent who told me in front of their embarrassed son that he sings it at home.